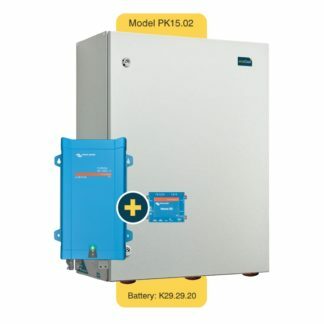 The PK15.04 package is an ecoCool K29 5.8KWh 48V home-battery, a Victron Multiplus II 3KVA interter-charger & Victron Venus GX energy controller. Nominal energy supplied at night: 5.8KWh (11.5KWh max); Nominal power output of 2400W, (5500W max); Installation time: 5-7 hours for your electrician. For homes with existing solar systems. This Residential Battery Package suits medium sized households (4-5 people) with 4+ KW of existing solar, already using 15-30KWh of electrical power per day. The PK015-04 system has a 5.8KWh nom. / 11.5KWh max. high-tech AGM battery, with a Victron Energy battery inverter-charger & wifi-enabled monitoring & control device. It is designed to recharge the battery from your solar system during the day, then discharge into your home power system at night. That means maximum self-consumption of solar power – and a minimised electricity bills. Upgradable later: via the CANBUS port – a Battery Management System (BMS) standard, compatible with most 48vDC Batteres. ecoCool does an energy analysis of your home, and we do an installation plan for your electrician. That assists you to beat the rising costs of electricity, by having a system adapted to maximise solar usage, and minimise grid power, saving you the most money. We supply the installation package and drawing to you, ready for your electrician to install, with minimum installation time & cost. Best of all, ecoCool’s Victron energy inverter systems are UPGRADE READY: they can be configured for much larger batteries, or different battery chemistries like lithium, flow & new technologies. * 5-10 days to despatch.